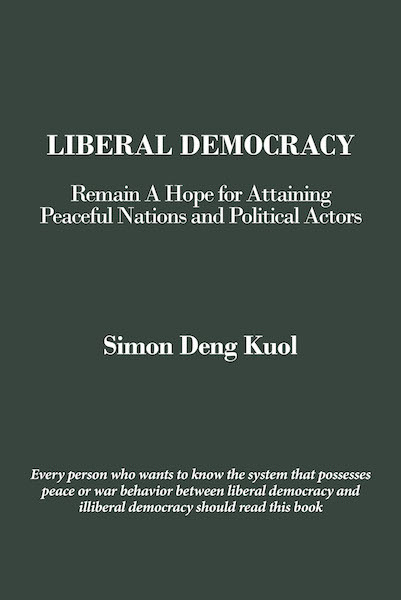 This book is about recognizing the works of notable liberal scholars who have conducted various studies in which their findings reveal that liberal democratic countries and their political actors, such as government officials, political party, interest groups, and mass media leaders are peaceful compared to illiberal democratic or authoritarian countries and political actors. The system of liberal democracy provides the best political actors that provide excellent services and goods aimed at responding to the citizens' needs equally, regardless of religion and political affiliation, race, gender, origin, age, etc. This glory works of delivering the extraordinary services to the citizens equally occur because liberal political actors have accepted all the principles of democracy and applied them to the systems of their respective countries' institutions. Illiberal democratic political actors are fearful to apply all the principles of democracy in the systems of their respective countries' institutions. Refusing to accept all the principles of democracy should be recognized as one among other reasons why illiberal political actors have more often initiated the civil wars and likewise fail to provide the excellent services to their citizens equally. Hence, a liberal democratic form of government shall be a hope to the citizens of the illiberal democratic countries for attaining the peaceful countries and peaceful political actors. To understand how a liberal democratic form of government can keep the peace, this book may provide you with all aspects related to a liberal democratic system that produces peaceful liberal political actors. This book provides an introduction that defines the liberal democracy and political actors, as well as describes the works of well-known theorists about liberal democratic countries and liberal political actors. This book can also explain the satisfactory justifications why liberal political actors, such as public officials, political parties, interest groups, media, and societies at large, are less likely to initiate interstate or civil war against one another since they become mature and stable liberal democratic countries. This book can likewise describe the peaceful functions of liberal democratic countries and their political actors in the political campaigns and elections.